Understanding the response of tree populations to climate is critical for formulating new seed deployment strategies to adapt to climate change. Growth response functions have been developed for lodgepole pine populations based on observations from a comprehensive provenance trial. Results of this study suggest: 1) the importance of using a reliable climate model in genecology to avoid misleading conclusions; 2) new analytical methods developed by the CFCG improve growth response functions; 3) populations from further south are not necessarily a good choice for future climates; 4) populations with broad adaptability can be identified; and 5) the potential of optimizing seed source selection to mitigate climate change is substantial. Using Illingworth lodgepole pine provenance trials and scale-free climate data generated by ClimateBC/WNA, we developed response functions (RF) (Wang et al. 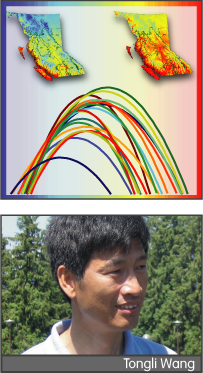 2006) and a universal response function (URF) that can predict growth potential for any seed source planted at any planting site (Wang et al. 2010). In the Illingworth trials there are 140 provenances and 60 planting sites. An unbalanced design tested 60 populations at each site with 10 populations tested over all sites as reference populations. 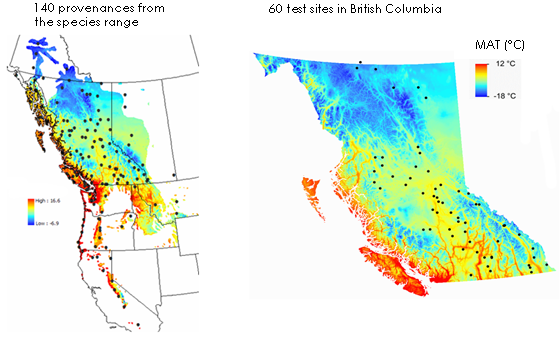 ClimateBC/WNA was used to obtain climate variables for provenances and test sites for the reference period (1961-1990) and future periods. We developed anchor points for populations not tested at colder environments based on the relationships between population performance and their provenance climate. 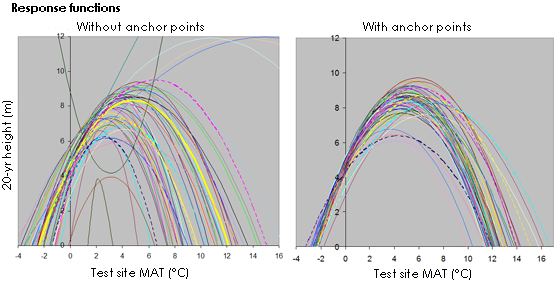 The anchor points improve the accuracy of the response functions for many populations. The response of a population to climate can be well modeled with a simple multivariate surface using mean annual temperature (MAT) and annual heat-moisture index (AHM), and their quadratic transformations as predictors. However, in order to compare the responses to climate among populations, we transected surfaces at the optimal values for AHM. The variation in response to climate among populations is substantial. Optimization of seed selection would considerably improve the productivity of this species under future climates. Climate is a major environmental factor affecting the performance of trees and is also a critical natural selection force molding among-population genetic variation. A population response function relates the performance of a population to planting sites (environmental effect), whereas an individual transfer function (or a genecology function) describes the relationship between the trees performance and their provenance climate (genetic effect). Both functions can be used in climate change adaptation applications, but they are either population specific (response functions) or test site specific (genecology functions). We developed a novel approach that integrates both the environmental and genetic effects into a single universal response function (URF). The URF can be used to predict the performance of any population at any planting site. The model-fit of the URF is illustrated below with a simplified URF. The URF approach considerably reduces the requirement in sample size to model the relationship between the performance of tree populations and climate. It also allows us to quantify and compare genetic and environmental effects of climate on tree performance. The URF provides a tool to determine where a seedlot should be deployed or where to procure seed for a planting site. 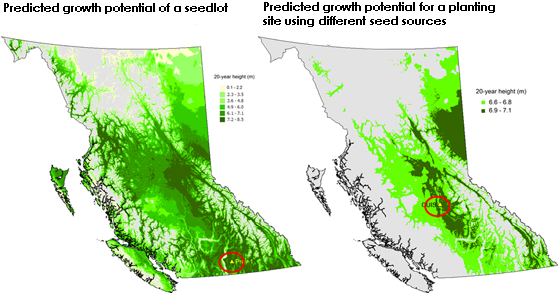 The following two maps show the predicted growth potential for a given seedlot being planted at different planting sites (left) and for a given planting site using different seed sources (right) for current climate. The URF can be used to predict the growth potential if local or optimal seed is used for a climate change scenario. The following example shows the growth potential for 1970s (1961-1990)(left), 2050s planting local trees (middle), or 2050s using optimal seed sources identified by the URF (right) for one climate change scenario (CGCM2 A2x). Wang, T., O’Neill, G., Aitken, S.N., 2010. Integrating environmental and genetic effects to predict responses of tree populations to climate. . Ecological Applications 20: 153-163. Wang, T., Hamann, A., Yanchuk, A., O’Neill, G.A., Aitken, S.N., 2006. Use of response functions in selecting lodgepole pine populations for future climate. . Global Change Biology. 12:2404–2416.